This movie scores pretty high on the 'weirdness' scale. But does it also make the movie an original and good one to watch? In some ways yes, but I definitely wouldn't call this a very successful or great movie. It is s good thing that this movie is trying to be different and is really taking on a style and approach of its own. I wouldn't even necessarily call this a horror movie. It is more a thriller with some horror tendencies and some unsettling moments. At first it is even somewhat hard to tell what this movie is really to do and tell. It is a pretty unusual and even somewhat philosophical movie at first, that however slowly develops into a more and more streamlined thriller/horror flick. What is vague and weird at first slowly becomes more understandable once the movie progresses toward the end. But does it also make things better to watch? Well, yes and no. It does make things more pleasant to follow, but at the same time it never feels like the movie is doing anything truly special with its story and concept. And once you really start to think about things, this movie really had a pretty promising concept in it. It is something that is more unsettling than truly genuinely scary, but it works pretty well. I at first didn't think that its concept would work out very well or interesting, but as things start to develop it does manage to succeed at letting its concept work out as a convincing and interesting enough one. It is all a bit too late though. Once the movie truly starts to get into gear and turn into a good and interesting one, it is already over. I wish the movie would have done more with its concept, instead of repeating itself so often and focus on its buildup, rather than its eventual payoff. It is not a boring or lackluster movie, but it does feel like it is taking far too long to get to its point, at certain parts. Besides, you often already know what direction things are going to head in and it is not like the movie ever surprises you with any of the twists or other story developments. It is a well handled movie, but at the same time its never quite surprising or truly original enough, despite a very original approach and style. It also most definitely is a pretty decent looking movie, with a good atmosphere. Definitely more horror like, even if the movie itself isn't really a 'true' horror. 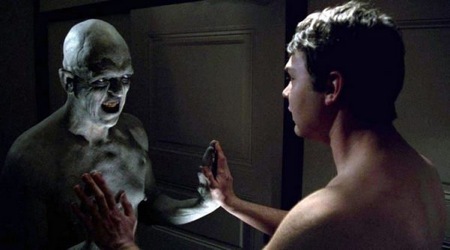 It also uses some good makeup and effects, which again, adds to the horror aspects and feel of the movie. It helps to give the movie a certain unnerving look and feel to it, though I wish that it all would have been part of a better movie. The movie also has some solid acting in it. Sean Patrick Flanery and Dina Meyer perhaps don't play the most likable characters, but they play their roles pretty well. Frederick Koehler is mostly exaggerating, but after a while he and his performance start to grow on you. It is certainly a pretty interesting character, once you get to know more about him and the movie begins to reveal more and more and slowly develops into something more sinister. A real good and interesting movie in some ways, but as a whole it still falls mostly flat unfortunately.